Early in December, Mike Ashley, the owner of Britain’s Sports Direct sportswear chain and the Newcastle United football club described retail trading in November as “the worst on record, unbelievably bad” He added “Retailers just cannot take that kind of November. It will literally smash them to pieces.” His insights were printed by just about every British publisher and broadcaster – and continue to be repeated. 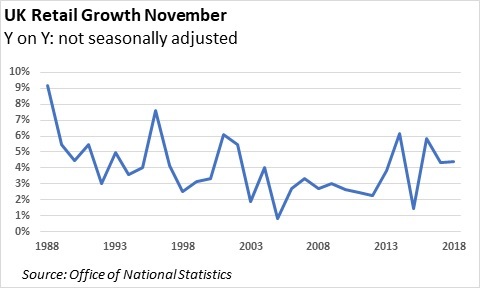 On December 20, Britain’s Office of National Statistics reported that November seasonally adjusted retail sales were 5% up on November 2018: the fourth highest growth rate in the previous twenty years, and among the half-dozen highest rates since it began publishing monthly retail sales. No medium pointed out the discrepancy with Ashley’s gossip: even papers like the Guardian (motto “Comment is free, but facts are sacred”) continue to repeat his now clearly discredited views. Ashley’s insights into retailing are notoriously partial: he speculates in retail shares, and has a vested interest in promoting gloom about businesses he wants to acquire. But he’s a cheeky chappie, and provides better headlines than statisticians do. 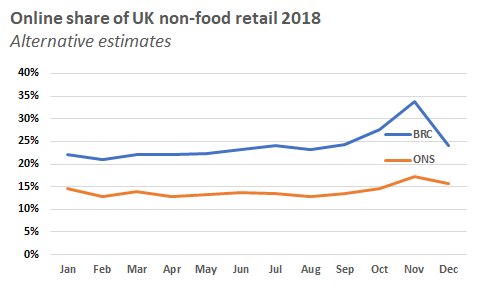 Helen Dickinson, BRC’s Chief Executive repeated the standard complaints about “weak retail demand” – adding concerns about “a record one-in-every-three-pounds of non-food purchases made online during the month. 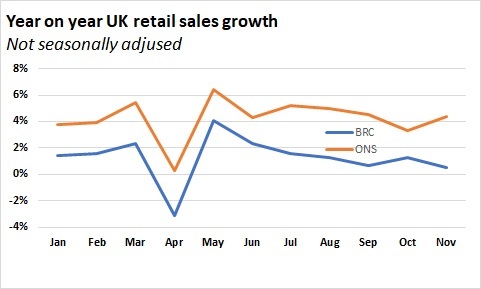 Indeed, BRC’s estimates of online sales levels in November are now twice those of ONS. The difference is less stark on sales – but still real. ONS reviewed the problem in March 2018, pointing out that comparisons with BRC should best be made with its non-seasonally adjusted data. They describe all retailers: BRC reports inly on its members, These are generally large (over 100 employees) and together account for just 60% of UK sales. BRC data has value: it reports more quickly than ONS and allows comparison of like-for like sales. But it clearly does not represent retail: it represents Big Retail – which clearly is becoming more and more different from the hundreds of thousands of smaller ones. No-one really cares what Mike Ashley says. But the BRC knows its members aren’t typical of most retailers – and both they and KPMG have known since March about ONS’ clear explanation of its atypicality. It’s simply wrong for it to make claims about “retailing” (like its extraordinary claims for online sales) it knows aren’t justified.